Rally Report 2008 From the viewpoint of the Organiser! First a sincere thank you for those members who supported the Rally by attending, contributing prizes (Arthur Fleming), organising kids activities (Jude Baddiley), or whatever. Thanks also to John Blackburn for helping with Rally Control and food serving on Friday night. My aim was to make this National Rally a special and memorable event and the site was superb in being different and offering a range of activities for all ages. I had some significant problems over the weekend and have identified these to the Manager at Midland Railway. It was a learning curve for them as this was the first camping event they had hosted but they are looking at developing this line of new business. I believe from the feedback to date that none of the problems spoiled the event in any way but I think some of that was down to luck with exceptionally good weather. 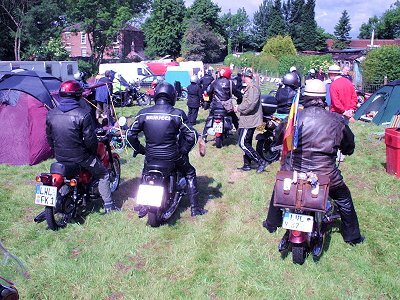 The overseas visitors from Germany, Czech Rep and Sweden certainly want to return and have asked us to publish a date for the 2009 Rally as soon as possible. 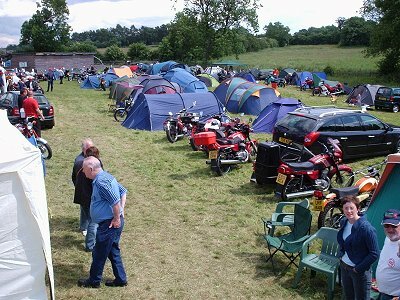 I have also been asked to arrange a camping weekend on this site in 2009. The media certainly enjoyed it with photographer Roy Maddox providing us with a CD of quality digital images which we will use on the web site and in Torque. 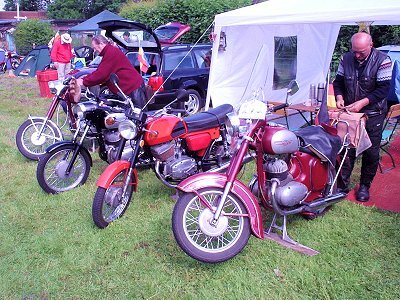 He wants a JAWA or CZ – a single cylinder bike – a bit special! Roy has also joined the Club. 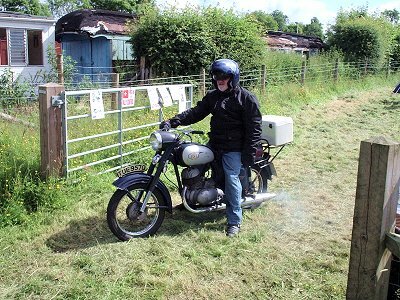 Nigel Clarke from Morton's Media also enjoyed the event and I expect some good coverage as he took lots of pictures too. Now the invoices are arriving I realise we should have probably charged £20 for the weekend but as the Club has a good bank balance that is not a worry. For the future we must fix a charge that reflects what is on offer. Gibby did a great job arranging the trophies – my thanks as it was one less job for me. 18 awards were made as in the good old’ days. That went very well. We ran out of raffle tickets so thank you for buying so many. Next time we will have more than 3 books (1500 tickets) to sell. 108 people signed in with 66 pre booking. I know we also had friends, partners and visitors who did not sign in and did not want a badge. We need to consider if we can continue to offer a “free” event to those people. I was disappointed by the total number of “paying” guests but the petrol crisis may have stopped some attending. 14 children were pre booked so we arranged for events and included 3 pages of line drawings to colour in - to be included in the Rally pack. We tried to get all kids booked in separately in case any had problems and we needed to contact the parent. That was only partially successful as only 10 names were on the contact sheet. Again, for the future and for ALL club events we need to get this right to avoid problems. Chris Baddiley received the Chairman’s Award for his work on our web site and I am grateful he was able to publicise the change of location. We were able to inform most of the pre bookers of the change by email or phone and also a few regulars we knew would attend. 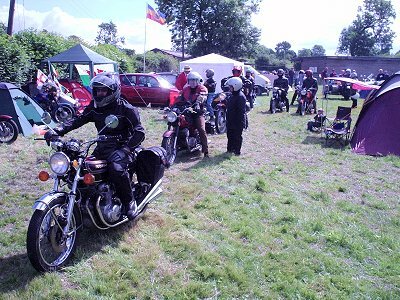 It is important that members check the website or contact any event organiser just to check all is well before you set off. Dave Blackmore, Jack Wainwright and Barry Hancox were lucky in that respect as I was able to tell them about the change of site before they set out. I still have a number of pinless Rally Badges for sale price £1. Send payment to Spares Officer/Secretary with a 27p stamped SAE. These are ideal to fix to your bike as a momento. To close - it was a total coincidence that my first club rally was our second national rally in 1978 and my kids were 6 and 4. In 2008 my grandchildren ages 6 and 4 camped with us for their first rally. Where have those 30 years gone? Once again I hope you had a great time in Derbyshire and thanks for your support.